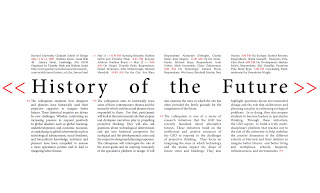 Neri Oxman will participate in the History of the Future symposium to take place May 11-12 at the GSD. Join for "On Technology", May 12th, 2pm (Gund Hall) directed by Prof. Antoine Picon. Respondants include Prof. Wes Jones, Prof. Reinhold Matrtin and myself.